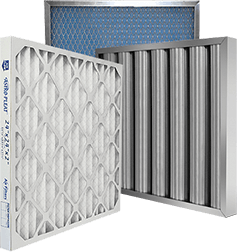 18x24x1/2 Sure-Fit Poly Dual Density White Dry Pad | Air Filters, Inc.
Air Filters, Inc™ SureFit™ Dual Density White Dry polyester media is used for a variety of industrial prefilters as well as HVAC applications and is prefered over fiberglass media. Our polyester is designed as prefilter media for engine and turbine intake filters. Commonly wrapped on the outside or inside of a filter cylindrical filter. The media has a special blend of fiber deniers that create a somewhat rigid filter medium. The material has many applications as prefilter or to be used as the main filter on electrical cabinets and small machinery applications.